ATR-72. I felt some curiosity about this airline so I did some research. Aurigny operates out of the Channel Island of Guernsey and ts network covers the Channel Islands as well as some airports in mainland Britain and France. This ATR-72 is one of the three the airline currently has, they entered service in 2009. 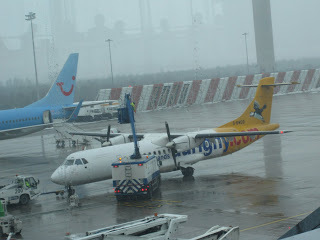 As a curosity, Aurigny Air Services is the longest standing operator of Britten Norman Trislander aircraft. I have to admit I had never heard of this aircraft type, I found its engine configuration remarkable, to say the least. Another curious fact of this airline is that, according to Wikipedia, the name Aurigny comes from the local French/Auregnais name for Alderney, one of the lesser Channel Islands, a language that was made extinct by the evacuation of islanders during the occupation of the Channel Islands in World War II.